This is a 5x7" oil sketch I did yesterday after visiting Minnekhada Lodge over the weekend. It is so beautiful out there, even with a migraine ;) The lodge hosting the second annual Art in the Park on the weekend, I will post more photos and info about the event later. 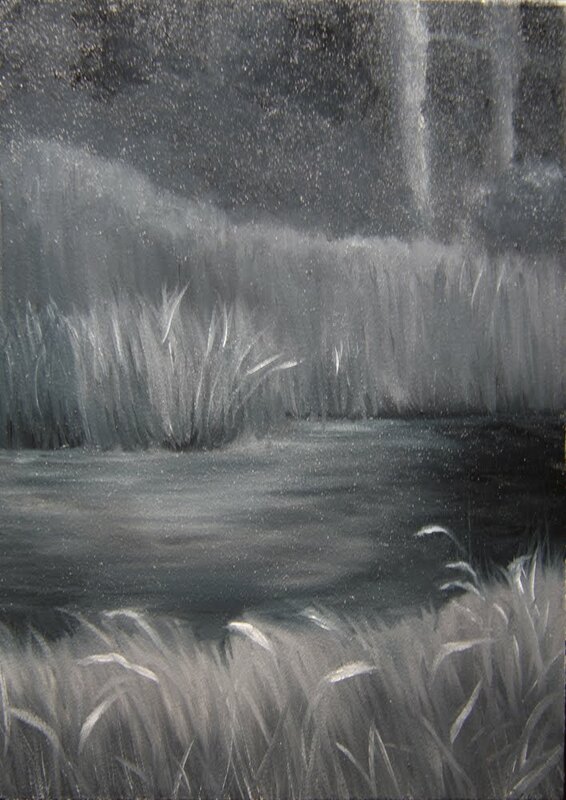 I have decided to do a monochromatic series of 5x7" oil paintings on panel and this is the first of the series. I love monochromatic paintings and was planning on mixing up a black and using a tube of white but then realized, duh, why not use some of the beautiful Torrit Grey that I got from Gamblin :) I have two tubes and each one is uniquely different as they are actually made from the pigments collected from the air filtration system during the paint making process. What a great way to protect the environment, workers health and as they give the paint away free with a small purchase (to prevent hording - they most know we artists are a little obsessive?). this piece seems to have a glowing quality about it, I like it. Tracey - this is really nice. Even without color it's interesting to look at. Nice contrast and soft feel.